I thought I would begin my third of a series of four livestock workshops at the University of Minnesota petting cute, cuddly lambs and kids (as in baby goats), but instead we started out sifting through a box of what looked like medieval torture instruments. The all-in-one castrator and tail docker, a clever little gizmo, was designed to cut off the relevant body part and simultaneously crimp the ends of the wound shut to prevent excessive bleeding. The hand shears, for clipping sheep destined for competitive shows, were more or less giant, extremely sharp scissors. My personal favorite was the hot-iron tail docker, most notable perhaps for its very low-tech-ness. The idea, which could literally have come straight out of the sixth century, is to heat the pincers of the docker over an open flame to make them hot enough to cauterize the wound that results from clamping them down to cut off a too-long tail. The presenter assured us that the university kept one on hand purely to provide us students with historical context. Not to worry, the hot iron docker no longer made the list of recommended animal-care instruments. The class’s discussion naturally progressed into a debate over whether the various medical procedures to which we subject livestock are necessary at all, and the relative humaneness of the different methods used to perform them. Castration is a common practice in the US for all the larger mammals raised for meat, including sheep, pigs, and cattle. The main reason for it is to keep males’ meat tasty. If the males weren’t castrated or otherwise treated, a small percentage of their meat would carry “boar taint”: a smell and taste that’s gamey and, some say, suggestive of sweat or urine. Risk-averse producers, aware that sweat and urine don’t tickle the typical customer’s tastebuds, would rather be safe than sorry and prevent any possibility of taint by castrating. Tail docking refers to the practice of cutting off most of the tail of the animal, and is quite controversial in pigs and cattle, where its usefulness is questioned. However, no serious sheep farmer forgoes tail docking, because the wooly warmth of sheep hindquarters provides a cozy environment for flies to lay maggots, especially when they’re covered with a hairy, manure-catching tail. Cutting the tail helps prevent an infestation which is unpleasant for sheep and farmer alike. So there are straightforward reasons to perform these procedures. Since the hot-iron method is no longer sanctioned by the university, I wondered, what is the preferred way to remove testicles and tails? The answer says a lot (but not much complimentary) about our attitude towards animal welfare. It turns out that the university advocates the widely-used “banding” method. Instead of cutting off the unwanted body part, the farmer snaps a tight elastic band onto the appendage. Eventually it shrivels and falls off. The process is bloodless and sounds relatively benign compared to the alternatives. But it’s not. Farmers in the room who had used the banding method as well as the cutting methods noted that after banding, lambs would retreat from the flock and refuse to feed for as long as 12 to 15 hours, a sure sign of discomfort. But after the more straightforward cutting method, they’d be back to normal in a mere five minutes. So, why choose a method that’s more painful for the animal? The U of M presenter more or less shrugged his shoulders. I was left with the impression that we animal stewards would rather let our charges languish privately in pain than see the bloody evidence of it staring us in the face. Lambs submit to this kind of treatment pretty meekly, but not goats. I left the presentation on these caprine creatures in awe of the audacious farmers who dare to try to keep them. 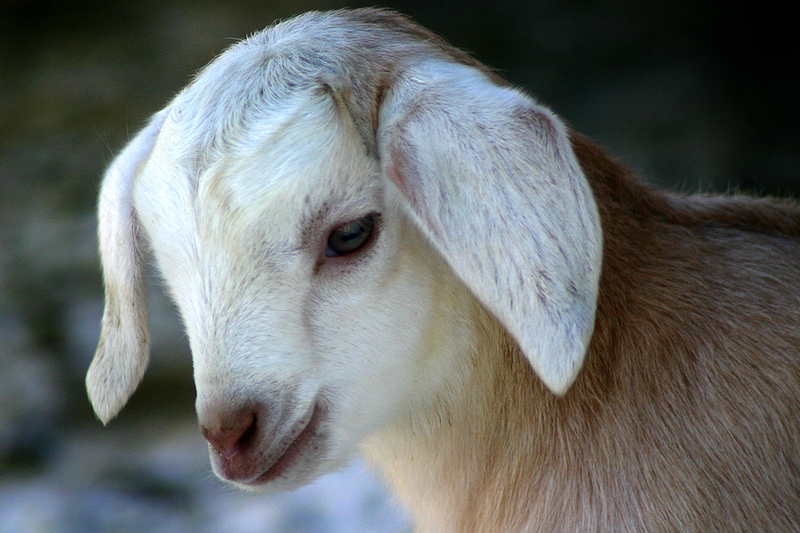 Inquisitive, energetic, and lawless, goats get into everything and anything they can, including the neighbors’ property. And following a wave of enthusiasm for goats in the early 2000s, there’s now an oversupply, so all the effort it takes to raise them doesn’t necessarily pan out financially. Caution seems to be the watchword for people interested in making a living from these bearded, cloven-hoofed mischief-makers. Next week: the ubiquitous chicken and cow, staples of the American diet. Angelique Chao is a freelance writer in Minneapolis who contemplates the ethical implications of our food choices. She thought she’d left philosophizing for good when she finished her dissertation and joined the business world; but after several years of corporate life, her natural disposition reasserted itself; she’s now a full-time writer and researcher. When she’s not out touring farms and processing facilities, you’ll likely find her at one laptop-friendly spot or another -- a library, a coffee shop, or home. She blogs at From Animal to Meat. Her last post for Simple, Good and Tasty was Living with Livestock, Part Two: The Maternal Instincts of Chickens and Pigs.